Once again war drums are being beaten and the media on both sides of the Indo Pak border is frothing at the mouth on the prospect of yet another conflict. Public opinion in both countries is being constructed towards hyper-patriotism and giving the other a bloody nose. Add to that the fervour of independence days of the two countries falling recently and you get a perfect recipe for disaster. The million dollar question is Can any of the two nuclear equipped countries afford a war that will only cause death and destruction on an unimaginable scale? The simple answer is NO. Let us take India first. India has done huge investment in recent years to bolster its economy to the extent that it can now boast of being the 10th biggest economy in terms of GDP. Its per capita GDP rose from $670 in 2004 to $1100 in 2012 which is no mean achievement by any standards. Just for comparison minded people, Pakistan’s in the same period went up from $530 to $670, but that is beside the point. The real point to take home is that war causes destruction on a massive scale both in terms of infrastructure and wealth. Economies go bankrupt within days and inflation reaches levels that are unimaginable in peace times. Even the strongest of economies take ages to recover from the devastation of wars but when the warring countries are both nuclear states, it makes the story even more unpredictable. India in its senses would never try such an avoidable (mis)adventure especially at the cost of nullifying all its economic achievement made in the last decade or so. Pakistan, on the other hand, is more than hands full with problems of its own; from economic woes to terrorism to drone strikes and floods, the list is endless. Its army is already over stretched with internal commitments in the North Western region. The last thing it will ever need is a full blown confrontation on the Eastern front too. Pakistan is in a much worse position compared to India as far as its economy is concerned. Relying on IMF bailouts, war is just not an option. Recent skirmishes on the border have brought the war mongers on both sides out of their holes and they are going into overdrive drumming up support for a full-fledged armed conflict. One Indian MP called for beheading 50 Pakistanis in response to the 5 allegedly killed by Pakistan across the LoC. Similarly, some self-proclaimed ‘defence analysts’ in Pakistan are having a field day with the ‘free’ news channels provoking the start of their version of Ghazwa-e-Hind. But where there are hawks, there are doves too on both sides of the border. Indian Defence Minister AK Antony gave a clean chit to the Pakistan Army over their alleged violation of LoC. Similarly Pakistan Prime Minister Nawaz Sharif called for the peace talks to be continued despite these incidents. What must not be forgotten here is that these hawks belong to a class of society on whom war would have the least effect. They will continue to live their lives as comfortably after the war as they are living now. The class that will suffer and has been suffering for the last 66 years due to this confrontational policy is the lower class – the poor awam of the two neighbouring states. Despite its recent meteoric economic growth, 30% of India’s population still lives below poverty line and for a country of 1 billion people 30% is a huge number. Pretty much same is the case on this side of the divide too. People lack basic health facilities, clean drinking water and sanitation – things that are considered a norm in the developed world in this day and age. Almost every time the buck stops with lack of finances. Looking at the budget sheet for the two countries, it doesn’t take a Ph.D. in economics to figure out where the lion’s share of the budget goes – Defence; on weapons of mass destruction, of death and devastation, of no use to the humanity! Now consider an alternative scenario and rewind the clock some 70 odd years. Germany was engaged in World War II with pretty much the whole of Europe and mainly Britain. Millions of people died and cities were flattened to the ground. Casualties far outnumbered those in all the Indo-Pak wars put together. But look at them now. Britain, France, Germany and Italy are few of the top economies of the world. Mainland Europe is one economic area; there are no border controls between the countries and trade is carried out freely and without any hindrance. They’ve left their animosity and conflicts behind and moved on for the betterment of their future. In it lies a big lesson for us: Peace brings prosperity to the people and war and hatred causes destruction and poverty. There is no reason why we can’t follow the same principle as these Europeans. We have more in common than them anyway and there is nothing we don’t have except will. Complete overhaul of the curriculum getting rid of all hate material against the other country. Education is the single most important player in the quest for achieving peace. This will not only breed our future generations devoid of hate but will also deny oxygen to the existing hate mongers. Strict and sincere peace accord between the two nations. Armed forces of both countries to have strict orders of not violating the LoC. Any violations from either side to be dealt with full force of the law of its own country. This will act as the first step towards disarming the LoC. Preceding point to lead to disarmament and significant reduction in defence budgets. The finances released this way to be invested in education, health and other development projects. Mass media campaigns to remove mistrust amongst the masses for the other country. It will take at least a generation of incident free time to get rid of the mistrust that has been built over the years, but this process has to start now. More and more opportunities to be provided to people from all walks of life to mingle up with their counterparts across the border; to let people find out that human race is peaceful and loving by default and that race, religion and geographical boundaries shouldn’t come between this natural instinct. Let us keep our egos aside and give peace a real chance for once, not for anyone else but for our own people’s sake. Together we can do it! Good Article. 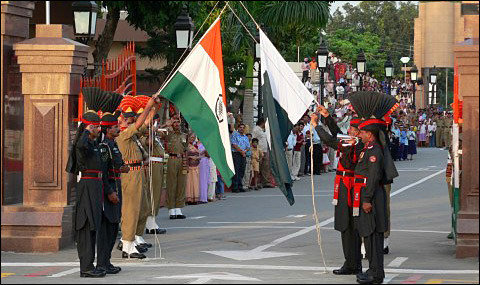 Although generally in rivalries like India-Pakistan people tend to flare up and consider it a matter of pride. But “Finding the right thing to do” requires an unemotional analysis. The situation reminds me of very relevant and insightful Sulah-e-Hudaibiya. It seemed really a move on back foot for Muslims and yet Allah called it “A clear victory”. In that age people traveled from Madina to Mecca (Imagine going from Pindi to Lahore on camels) based on Prophet SA’s dream and the deal didn’t even allow them to perform Umrah in that year. We have all heard of Abu Jandal RA and the related clause that Muslims from Mecca will be returned, while reciprocity is not applicable. With such a treaty no wonder Sahaba RA were furious and Umar RA even used some harsh words (which he used to repent later). When Prophet SA asked Sahaba RA to do animal sacrifice and return back, they didn’t follow the orders which did hurt Prophet SA. Then on advice of I guess Umm-e-Salma RA Prophet SA performed animal sacrifice for himself and then everyone followed. The point of remembering the tense situation is that Allah called this deal clearly on back foot not only a reasonable deal but he called it “A clear victory” (Fatah-e-Mubien). How was it a clear victory? Different people have given many reasons. My personal view is that the grounds are not equal when its peace. Firstly, peace gives a chance to explain truth to the people properly which naturally resonates with their nature (Probably whole point of religion is try to convince people to enter religion on free will, beliefs can not forced into minds). Secondly, believers expect reward in afterlife and this puts them in much motivated position to carry on this mission of convincing people than the Non-believers. The Non-believers don’t have a serious motivation to convince others. So even if the deal in terms of clauses seemed not favorable, the balance afterwards really shifted towards the truth and more and more people got convinced on believing in one creator instead of idols. Sometimes, I feel that aggressiveness quite often originates as a defense mechanism rooted in lack of conviction about the truthfulness of one’s own beliefs. Perhaps if we stop processing our situation with India from the religious perspective, things would be simpler. Reblogged this on What Lies Beneath The Rock. agree fully though hawkish in my early youth..I am for peace with India…Actually nuclear deterrent was the best thing both countries could have and my argument is they can never go to war again unless there are two mad people on both sides..we should both concentrate on our economy.. When India was partitioned no one in their wildest dreams could have thought they wont be able to go back and meet their friends or relatives on the other side of the divide. Its such a shame we cant have open borders because of extremists on both sides which hijack the country and masses. education is the key to this..We need to stop spreading hate..